Boring. One Amazon reader said “Salter is often mentioned in the breath just after American masters like Philip Roth, John Updike, and Norman Mailer.” Well no wonder – it’s all about boy meets girl, lays girl, perhaps marries girl, divorces girl, finds another girl – musical relationships amongst disposable people. 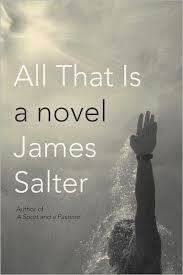 I truly didn’t care what Salter could dig up from his past (real or imagined) to dwell on. I think I’ll call this genre male romance -“Everything he had wanted to be, she was offering him” – the daydreams of old-man writers like Roth and McEwan and Updike and too many others. “Musical relationships amongst disposable people” – exactly – only I would add that the music is discordant!